My jaw dropped when I saw the photo of how intact this deck-roofed combine passenger car was found in a small Montana town. I hope the restoration team can be encouraged to learn more about the car prior to losing an irreplacable historic artifact in the creation of a tourist train. Now, before someone from this group runs off and irritates the guys in Montana about their plans, it would be nice if they were approached in a friendly way about what options they really may have available to them. 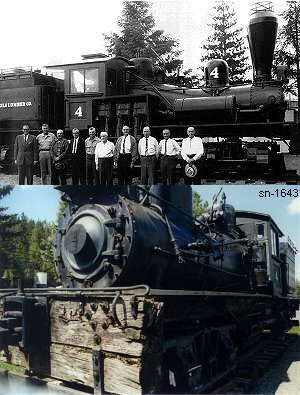 LIBBY — The Shay Locomotive has had a long history of hauling timber in Libby, and as Heritage Museum volunteers sought to pump new life into No. 1643, they were searching for the perfect companion piece. Last week the marriage of engine and car was consummated as a Civil War-era passenger car that was once owned by the Ringling Bros. and Barnum & Bailey Circus was delivered to Libby. Carter, Museum Board President Dave Etienne, volunteers Doug Adams, Jay Matthews and Joe Swartzenberger of South End Towing, who drove the 400 miles to White Sulphur Springs to pick up the railcar, inspected the 19th century relic upon its arrival. Carter’s dream — and those of his volunteers — is to have the refurbished Shay locomotive pull the renovated passenger car through the Port Authority property and perhaps even across the Haul Bridge that would include an eight-mile loop. A date of completion is unknown, mostly because the work is contingent on donations. John Ringling? Maybe. But I'm not buying either "Civil War era" or "Barnum & Bailey Circus." Two more modern cars depicted on that page. Still there? The railroad that it came from (White Sulphur Springs & Yellowstone Park) was built in 1910 and most likely bought the car used, so it could date from the 1860's but it looks 1870's or 1880's to me. The railroad interchanged with the Milwaukee Road in Ringling Montana. I would postulate that the reporter or someone else heard the word ringling and associated it with the circus because it made a good story. Anyway, it is a neat looking car and I am glad to see that it will get some attention and not return to the earth from whence it came. NP #633 is one of a group of coaches built in 1912 by Pullman. Two cars from the same Lot as the #633, the #634 and #627, are owned by the Lake Whatcom Railway in Wickersham, Skagit County, WA. Wickersham is southeast of Bellingham on the old NP Sumas Line between Seattle and Canada. Both the #634 and #627 are in Pine Tree Green paint. The southern half of the Sumas Line was torn out and the RofW converted to a trail, but the northern half is still used as a Port of Entry by BNSF, using a junction from the ex-GN main at Burlington. The Lake Whatcom Railway operates over a remaining section of the ex-NP alignment into Bellingham, which followed the eastern shore of Lake Whatcom. The NP's Bellingham line met the Sumas Line at Wickersham. The Lake Whatcom Railway also owns several other NP heavyweights, including café coach #1681 (in Loewy paint), and NP steam locomotive #1070, which is currently out of service. Trains are currently pulled by NP switcher #30. There was also a good discussion about this on the Narrow Gauge Discussion Forum, however I can't find the thread. This was back in May of 2012. And Mike your posting was that this might be a on-time PRR car. The line never owned it's own motive power, consistantly leasing steam and diesel power from the Milwaukee Road. Somewhere in the mid-70's, the owners of the line acquired a light 4-6-0 (now somewhere in static display in Iowa I believe) that was used for tourist trains from White Sulphur Springs South. Not sure that they turned the steam engine, or if they ran around at the nearest siding. The line accumulated a number of cars, including the one's Les Beckman listed, but also the Milwaukee Road heavyweight Solarium Lounge "Coast", GN 902 (subject of an aborted thread by Flo) and a diner of unknown vintage in gray primer. Of these I think that only the GN, NP and possibly GTW cars (which I recall having chalked numbering stenciled, but not painted on it in 1982). One of the last projects the train was involved in was in shooting portions of the movie "Heartland". The train is shown moving slowly through the Smith River Valley before "arriving" at White Sulphur Springs. This involved some in train shots and station unloading scenes. At this point, from inquiries with the Meagher County Clerk and Recorder, the railroad equipment wound up being owned by one of the film studios/principals involved with the film. When the Milwaukee Road quit in 1980, the passenger equipment was left landlocked. Eventually the steam engine (in a single stall engine house to the south of the current equipment) was removed. Also left behind was the Milwaukee Road stock car and the two bay hopper, modified with ballast doors. Since then, the Milwaukee Road "Coast" has been moved to a ranch just west of Livingston. I believe this is the former Fort Riley(?) or a similar car that some have considered suited for preservation at the like of IRM (but have not coughed up the money. As I hear tell, the current owner would like to recover his costs into the car (trucking it down from White Sulphur Springs, etc), so, it sits. The GN 902 wound up on the Central Montana Railroad, which is the former MILW Northern Montana Mainline to Great Falls. It is currently stored at Arrow Creek, I believe. The diner was either scrapped, or may have been moved to Chico to become a private residence (according to an anecdote related to me by a staffer at the Livingston Depot Center 15 years ago), though it was reportedly dropped in the process of moving. I was in White Sulphur Springs on the Fourth of July in 2012 and I didn't recall seeing the ballast hopper, so it may have been scrapped, or moved to some other purpose. The NP cars still looks tight, the GTW car is pretty much a ruin inside, with the roof failing, though the carbody still has ice bunker AC equipment (and probably decent trucks). The site is maintained as some sort of quasi public park/musuem space, though there is no interpretive information present. It's pretty dry country around there, and as the wood car moved to Libby can attest, things can last a long time if a good roof is kept on them." Terrific info. Thanks very much. Interior pix of the car--you do have to scroll about 3/4 of the way down to see them, but it's worth it. The line accumulated a number of cars, including the one's Les Beckman listed, but also the Milwaukee Road heavyweight Solarium Lounge "Coast"
The Milwaukee Road "Coast" has been moved to a ranch just west of Livingston. I believe this is the former Fort Riley(?) or a similar car that some have considered suited for preservation at the like of IRM (but have not coughed up the money. As I hear tell, the current owner would like to recover his costs into the car (trucking it down from White Sulphur Springs, etc), so, it sits. MILW "Coast" was originally one of a group (number unknown) of 12S-1DR sleepers built in 1910 by Pullman in Lot #3787 to Plan #2477C*, named in the "Camp"-Series, and assigned to the Milwaukee Road. In 1931, at least two of these cars were reconfigured to buffet lounge solariums (16 seats), and named after towns on the MILW. *I don't know if this was the original Plan from 1910, or if it was the Plan after the 1931 rebuild. "Camp Grant" was initially renamed the "Terre Haute", and was later renamed the "Harlowton". 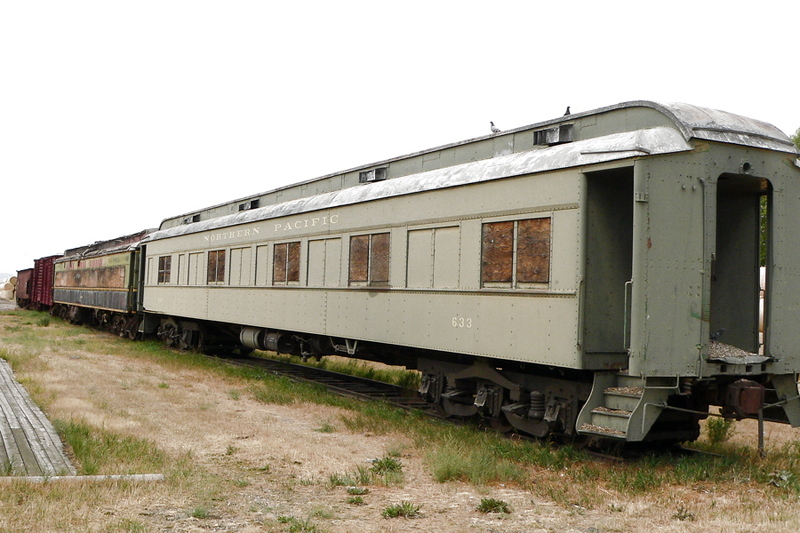 The "Harlowton" was later retired from MILW revenue service and transferred to the MofW department as camp car #X830. It was sold sometime in the 60's to Golden Arrow Tours in Janesville, WI. It was later resold to a private owner in Pontiac, MI. Another private owner in Saginaw, MI, later acquired the car. The car was moved to the Illinois Railway Museum for storage. After arriving at IRM, there was apparently some sort of accident involving the car and the overhead trolley wires. There was inside fire damage, including a hole in the roof, and as the car was apparently still owned by a separate group at this time and simply stored at Union, this put the car in limbo. Eventually (I don't know the details), IRM decided to deaccession the car and it was scrapped in 2009. I don't know if the deaccession was because IRM determined that the car was non-recoverable in terms of stabilizing the condition, or if the bills resulting from the car's separate ownership, storage fees, and fire damage, made deaccession the only logical conclusion. "Camp Randal" was renamed the "Madison". The "Madison" was later retired from MILW revenue service and transferred to the electrification department as #X420. At some point it was renamed "Coast". This was possibly while in use by the electrification department on the Milwaukee Road's Coast Division, but I haven't found much to clarify this. This is the car that ended up on the WSS&YP, and is now owned by a private individual outside of Livingston. Michael: interesting that your sources list the "Coast" as the former "Fort Riley". I don't have a complete roster of the "Camp"-Series sleepers and their dispositions (names appplied at the 1931 rebuild, retirement dates, etc.). What makes this even more confusing is the existence of another "Camp Randall" (notice the different spelling) that was part of the Great Northern Bar in Milwaukee. Some of the cars that made up the bar are now part of the collection at the Kansas City Rail Experience, but I don't know the current whereabouts of the "Camp Randall". During its years as part of the bar, it was painted in UP Armour Yellow and lettered for the Milwaukee Road. If this "Camp Randall" was indeed of MILW heritage, what's the story?? The steam locomotive was a 1920 Baldwin 2-6-2 built for the Florida & Alabama Railroad (Bagdad Land & Lumber Company). Later in life it turned up on the Cadillac & Lake City and the Dry Gultch Junction tourist railroads, then a brief stay in Montana, display in Iowa, and is last reported at the Fremont & Elkhorn Valley in Nebraska. The March 1980 issue of Railfan & Railroad has a short article by John Terry with some photos of the engine under steam at White Sulphur Springs, but no specific information or photos of the cars. That is my blog that Mr. Seitz is linking too. My relationship with the Heritage museum goes back to when it was built, as I lived 100 yards from the present location, and the Shay at the museum was one of several my great grandfather and grandfather operated. I posted several posts on the Heritage museum and the shay when I was contacted by Dave Eitienne, a museum volunteer, whom told me of the plans to restore Shay SN 1643. Like many I took a wait and see attitude. Dave asked me if he sent me progress pictures, would I cover the progress on my blog, and help spread the word. I agreed of course, since I would like to see the museum make a go of it. As far as this "civil war" passenger car is concerned, I was slightly alarmed when I read this, but my concern quickly waned as I see that some knowledgeable folks here did some research and set the record straight. I think most would agree that this car has a better chance at the Libby Heritage Museum than sitting in a field of cowpies for another 60 years. As I mentioned I was born and raised in Libby but am currently TDY in Louisiana, if anyone is ever in the Alexandria area, make sure you visit the Southern Forest Heritage Museum. I know several member of that museum are also members here, but I haven't noticed if any pictures exist. My trip report is here. I wish the OP would edit the post header as the information about "civil war passenger car" is completely wrong. I'm glad no one "went off and irritated" the museum volunteers based on this forum post. More updates here, have fun. For something of that vintage, and in consideration of its post service life, this car is in remarkably intact condition. Preservation will be a tremendous challenge, but by knowing the car number, a much larger base of information is available to give the group guidance in what to to and where to go next. Hopefully the group's resources will permit doing the best job available.